Honoring a special request from JC in SC, the tiny TYRANT design will be available on hoodies for a 1 week only. 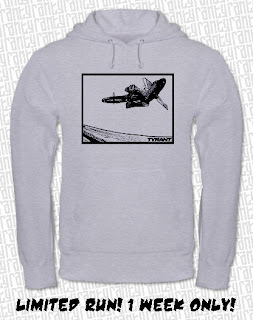 If you're down with staying warm and the tiny TYRANT flattie graphic grab a hoodie while they last. Limited run ends Monday, January 10th. Buy now or buy never...this won't be offered again!